Last year, ninety-nine organizations participated and became the beneficiaries of nearly half a million dollars. 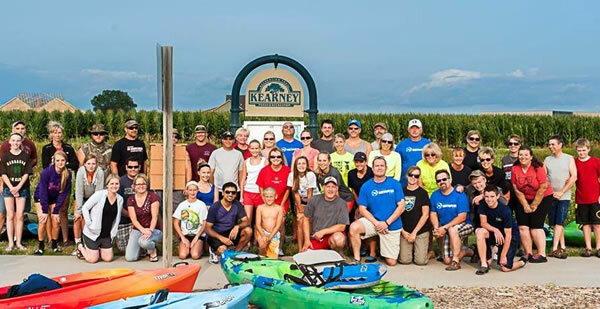 In terms of number of donations, the Kearney Whitewater Association took home the top honor in 2013. KWA’s flagship project is the proposed project known as the Kearney Whitewater Park and Trail. “We want to transform Turkey Creek and the Kearney Canal Tailrace into a recreational water trail with phase one starting at 11th Street and extending a half mile south along Yanney Park,” said Bruce Karnatz, a local agronomist who helped start the KWA Facebook page and website, along with several other members. Karnatz doesn’t claim to be an avid whitewater kayaker or rafter himself. That’s when he ran across an online video of Rowh and his friend, Cory Prellwitz, showing the two whitewater kayaking, an interest they liken to others who are passionate hunters or golfers. The plan has become much more formal since the early days at the sports bar. Rowh said that, early on, the City of Kearney and NPPD hired a well-known, professional designer to explore some possibilities for the whitewater park and trail. The designer came up with four different plans, from Olympic-caliber, to much simpler. KWA continues to put out new videos in an attempt to address concerns that the public might have about the evolving plans. In addition to costs, the group said they occasionally hear concerns about property rights and liability issues. Still, the issue needed to be raised on whether or not the water park is necessary at all. Is it simply one of those pet projects desired by a small group of nostalgic dreamers who don’t want to travel to Colorado to experience the rapids? On December 4th, KWA hopes to raise enough funds through “Give Where You Live” to hire an engineering firm to spec out the logistics of the whitewater park and trail. Admittedly, there will be more than a hundred other organizations also hoping to raise money for equally noteworthy causes. But there seems to be something about the impassioned fan base supporting the whitewater trail that has kept this project generating buzz on the local radar. The three-phase whitewater project has a long ways to go . . . and so do many of the other projects proposed by various organizations trying to raise money in the community. Certainly, the half a million dollars raised at last year’s “Give Where You Live” event was helpful in progressing those projects forward. There’s something of a “non-taxing feeling” to the idea of residents getting to choose themselves how to spend their dollars on a very individual and personal level. Whether or not one particular organization stands out of the crowd at this year’s event will probably be of little concern in the end. On December 5th, the storyline will more likely center around the overall impact felt by the collection of Kearney-area organizations who benefited from their supporters’ contributions. Editor’s note: KWA’s Give Where You Live donation page can be found at http://givewhereyoulive.razoo.com/Kearney-Whitewater-Park-2014. The group is also hosting an event December 4th from 10 a.m. to 10 p.m. at Yanney Heritage Park. More information about Give Where You Live and the other organizations that are participating can be found at http://givewhereyoulive.razoo.com/. Neil Emeigh, a UNK junior from Wilber, Nebraska sat down with me to recall the lowest point of his summer attempt to ride his bicycle from Kearney to San Francisco. He set out on the trip with his roommate and friend, Seth Schnakenberg. My own relationship with Emeigh was previously an employer-employee one; Emeigh was an intern for my company during the spring semester of 2014. As an intern, I remembered him as a good kid, smart and confident, but his mind always seemed to be somewhere else—on an adventure somewhere. He reminded me a lot of myself at a younger age. I knew it would be hard to keep him tethered to the computer for long. 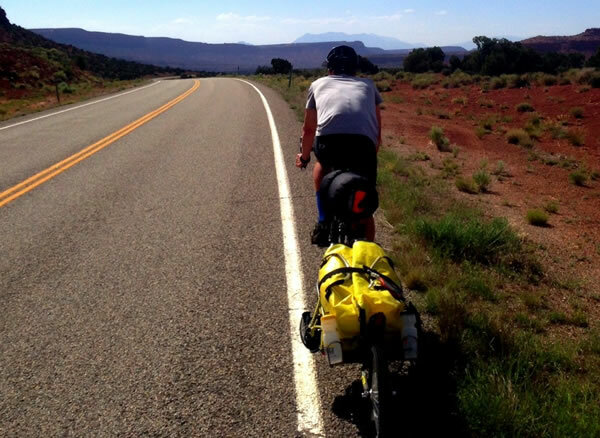 Just hours after his semester and his internship ended, I heard that he had already hit the road and was pedaling west. Back home at the office, we had a pool of sorts that we started. How many miles would Neil make it before he threw in the towel? That was the premise. The jab was aimed less at Emeigh and more at the absurdity of the situation. The unique timing of his employment meant that we never had him work on a project that had a prayer of being finished. He was stuck tinkering with pieces that were nothing more than interesting concepts and broken pipe dreams. I had personally observed our intern “training” two weeks prior to his departure by tugging a tiny bike trailer down an incredibly flat stretch of Highway 30 between Kearney and Gibbon. I put him down for 800 miles in our office pool. But it didn’t take much more than five days and 300 miles for Emeigh’s emotions to hit rock bottom on his extended journey of struggle and self-reflection. Still, Emeigh said he didn’t consider giving up just yet . . . that came on Day 7. That was when the two finally hit the foothills of the Rockies. Things were looking bad for me, too, at least as far as the office pool was concerned. Although I didn’t know it yet, he was barely halfway to my projected 800-mile mark and he had already run out of spirit. But the pair decided to reevaluate their goals rather than quit completely. They quickly adopted a just-make-it-over-this-next-mountain mentality and slowly, but persistently chipped through the Rockies. Emeigh said that the physical demands of the trip only took a proportionally small toll. Although he said he usually wasn’t concerned about making it out alive, I was quietly concerned for him back home. A few days after his departure, I packed the family into the car and headed southwest for a couple weeks to attempt my own mission—a vacation. We found ourselves intersecting many of the same roads that Emeigh had just travelled. I began to plan some imaginary rendezvous points in my head to see if we might be able to catch up with him and toss him a sandwich. Each day, I tracked his progress through his blog at LifeJourneyed.com. Riding in the car, I sometimes read the posts to my wife. I found myself cheering for him a little more each day. I really didn’t care about the pool. Especially not now. By Day 15, I became worried. Probably. Still, I wondered if we should change our course and sacrifice a couple days of our own trip to go find out. I tried to check my phone to calculate the logistics. No signal. I knew at this point that we were pulling further away from his current location with every hour that we drove. I decided to wait out the uncertainty. The next morning in the hotel, I got up a little earlier than usual. I grabbed my phone off the nightstand and cursed as I tried to get the public wi-fi to work. Eventually I was able to pull up the blog. Initially, he wasn’t too worried about their long-term outlook. He was confident they’d find water. They started processing lake water by hand using a manual filter that they packed in their tiny bike trailer. Emeigh first told me of this story and about a dozen others right after he returned from the trip. He dropped by the office one day to pick up his last paycheck that he impatiently left behind. I was fascinated by what I heard. He actually lived the kinds of adventures that used to live only in my own wandering head. I wanted to hear more. “How about when you get back from Korea?” I asked. And that’s how it went with Neil. He was teaching me patience . . . or at least teaching me a lesson for keeping myself tethered to a computer all day. When I was finally able to catch up with him again this week, he spewed out dozens of adventures from the bike journey alone. He was starting to sound like The Most Interesting Man in the World. I suggested that he drive the route in ten years with a camcorder and a creative writer to track down the people and places and reflect on the previous decade. I thought it would make worthy documentary material. Emeigh does plan on driving the route again some day, but it’s too soon for him right now. He said he has to suppress thinking about the trip too much because “reliving it is too nostalgic” and it easily “consumes” him. He does think often about the “great” people he met along the way, but he has never tried to contact any of them. He also doesn’t plan on riding the route ever again on a bicycle. “What about your next adventure?” That question was a given. Emeigh said that he now divides his life up into two segments: life before the bike ride and life after the bike ride. As for the Neil before and the Neil after, I completely agreed. He was still the same kid, but I was now able to see a new side of him. He wasn’t just an intern anymore. As with many interns, you just hope the experiences you share together aren’t a disaster and something productive comes out of it. You just want them to leave having finished something. It always felt unfinished with Neil. “I’m going to pedal all the way to San Francisco, Travis,” he told me right before he ended his internship with me. He did. On Day 29, he and Schnakenberg reached the Golden Gate Bridge, days ahead of schedule. Nobody ended up winning the office pool…except for Neil, of course. I didn’t even tell him about it until long after he returned. He just laughed. I should have put him down for 2,006. Next time I’ll have a little more faith. Next time I’ll offer a bigger challenge. – copyright 2014 Hollman Media, LLC. The Kearney App: Your interesting news source. Thirteen-year-old Mason Casper was being pressed on the issue of whether or not he thought the recently-approved restaurant occupation tax was necessary for the future of baseball and softball in Kearney. Voters approved the tax, which will fund approximately ten new fields in Kearney. His dad, Scott Casper, sat quietly at the other end of the table and watched his son take on the tough questions. For the Caspers, it was a familiar scenario. Mason’s dad often found himself on the Little League sidelines, whether it was in his role as a coach watching Mason take on fast balls, or in his role as a fan and dad cheering from the cheap seats as his son delivered his own share of fastballs from the mound. But when it came to political perspective, Mason preferred to bunt the question in favor of focusing on the bigger picture. 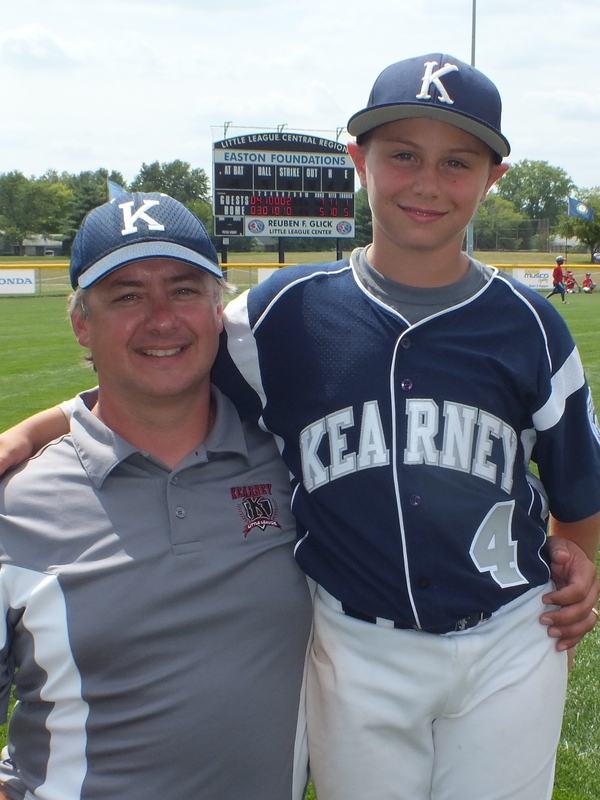 For his dad, the lessons learned from youth sports are just as much about the losses as they are about the wins. Regardless of which way the vote turned out during the November election, life would go on. Casper believes that the competitiveness of youth sports is a healthy quality that should carry over into adulthood. Mason chimed in with that sentiment. As a coach, Mason said that his dad is as good as it gets. Mason said that nerves can be touchy, especially when playing larger venues like Indianapolis, which his team experienced last year. When asked how his dad handles the kids during the big games, Mason didn’t hesitate. Casper said that concept should be carried over into all aspects of the game. Both father and son embraced the sport at a very early age. Dad reflected on growing up in the 1970’s and 80’s and how the landscape has changed over the years. But Casper was quick to point out that he thinks Kearney is different. When asked why he believes Kearney has had such success with its ball programs at a regional and national level, Casper pointed again to the culture in Kearney. When asked if he ever thought he’d get burnt out on baseball, Mason’s response was quick and emphatic. Mason, a Kearney Catholic eighth-grader participates in a variety of activities including basketball, football, and robotics. But baseball remains his favorite activity and most of his athletic aspirations center around that little white ball and his two favorite positions: second base and pitcher. Few would disagree that Williamsport is a breeding ground for memories and memorabilia, but Kearney is filled with thousands of parents and millions of fond memories of weedy sandlots from previous generations. Whether it was a win or a loss twenty years ago doesn’t matter so much now. Time has a way of softening even the worse of losses into the best of memories. Regardless of how the vote could have turned out during the recent election, the game will always go on…not just in Kearney, not just for the Caspers, but in the minds of all those who learned those intricate life lessons through something as simple as picking up a ball and failing over and over again in hopes of that one big play or that one big win.